Sorry to disappoint, but A Star is Born is not a documentary about Lady Gaga’s life, as many who are too young to hear of the original films assumed. Instead, she makes her glorious movie-star debut, and first-time director Bradley Cooper takes on the ambitious task of adapting a classic Hollywood story while starring in the film alongside Gaga. Three films with the same name have been made previously: one in 1937, 1954, and the latest in 1976, all of which featured some of the biggest stars of the time: Fredric March, Judy Garland, James Mason, and Barbra Streisand, to name a few. This version takes on an identity all its own, in a way that almost transcends time and pays homage to the previous films. It’s clearly set in the present day, but it visually and musically pays homage to the wild recklessness and sultry edge of the 70s rock scene. This is a film that could’ve easily been made thirty years ago, but because of the way that Cooper was able to capture the spirit of that era and intertwine it with the modern reality of what it takes to “make it” in the music industry, his work is all the more impressive. 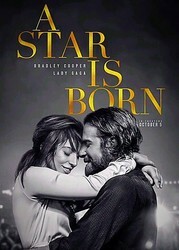 Still, it’s first and foremost a love story, one that begins when immensely famous and talented yet troubled country star Jackson Maine (Cooper) first hears the angelic voice of Ally (Gaga) when he stumbles across a drag bar after one of his gigs. They end up spending the rest of the night exploring and conversing, eventually leading to Ally humbly revealing her incredible songwriting talent in a convenience store parking lot. Jackson realizes in that moment just how much potential Ally has, though she doesn’t believe it herself. At Jackson’s next gig, he lures her onto the stage to perform that same parking lot song, catalyzing their massive success as a musical duo and their passionate, unrestrained, complicated and tragic love affair. While on tour with Jackson, Ally meets Rez (Rafi Gavron), a record producer who makes all her crazy fantasies come true by saying, “The question is, what do you want?” Ally signs the record deal and begins working with him, but the direction that he takes her in is much more glam, mainstream, and synth-driven: far from the intricate piano, electric guitar, and belting vocals that characterize her performances with Jackson, which is where Ally truly shines. Their love for one another does not waiver once, but that doesn’t mean that it’s uncomplicated. Jackson’s undeniable love for her is shown when his frustration only stems from Ally’s divergence from her raw artistry, not from her growing worldwide fame and acclaim. Most poignantly, Jackson’s enduring struggle with addiction and Ally’s persistence and patience with him is profoundly moving and an important story to tell. Musically, the first half of this film is completely and utterly mesmerizing. When Ally pulls off the enormous choruses, it ignites a physiological electricity that almost mirrors what it it’s like to be on a massive high. It is undeniably insane how brilliant Lady Gaga is. Bradley Cooper is just as captivating and extremely convincing, even in the vocal department. The music’s quality tapers off towards the middle during Ally’s pop era, but the choice to make the pop songs a bit dry and repetitive is important to the film’s theme of remaining authentic. The plot can drag on a little in the second half with a run time of two hours and fourteen minutes, but both actor’s performances continue to be excellent and each scene relevant to the story, so this length is entirely justified. A Star Is Born is truly a cinematic experience that will likely remain relevant for long after its premiere. It’s receiving massive awards buzz and the soundtrack is topping the iTunes charts: and rightfully so. Similar to how the two characters fell for each other, you’ll fall for the technical excellence, but more importantly the spirit, of this film. Freshman Amanda Leonard is Arts & Leisure Editor. Her email is aleonar1@fandm.edu.